1. Removal of debris from lawn surface cans, bottles, litter, sticks etc. 4. Edging of all grass that borders concrete driveways and sidewalks. 5. Cleanup and power sweeping of all grass clippings on concrete driveways and sidewalk areas. 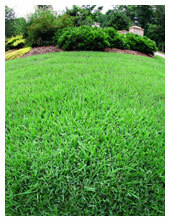 Homeowners and business' have trusted Atlantic Lawn and Landscaping to provide complete lawn care for their homes or rental properties since 1987. Many of our client's properties are serviced for just $25-35 per visit. Atlantic Lawn & Landscaping is a Full Service company, providing local and absentee homeowners with complete Lawn Care services. Prices are determined by the size of the property, the amount of time and labor involved, and the amount of extra services requested. Do you know the optimum height and frequency that you need to be mowing for your specific turfgrass variety? We have found that mowing is a very important part of proper lawn maintenance and plays a huge role in the overall quality of your turfgrass. Did you know that if your mowing height is lower than the optimum range for your variety, undue stress will occur which can cause a steady decline of your lawn. As a result weeds, diseases, and insects may invade your site. The same goes for frequency of mowing. If a lawn care company is leaving "windrows" of grass clippings when they mow, they are probably mowing too infrequently. A good rule of thumb is to never take off more than 1/3 of the leaf blade each time you mow. At Atlantic Lawn and Landscaping we first determine the mowing height most appropriate for your lawn and keep the grass that height for the season. We always keep our mower blades sharpened. You and your lawn will be pleased with the results! Sign up now for the upcoming season. That improper mowing habits can place significant amounts of stress on your lawn? Take the worry out of your lawn care maintenance by trusting Atlantic Lawn & Landscaping handle all of your lawn's regular maintenance and care. We offer complete onsite service from one company with one invoice. Copyright © Atlantic Lawn & Landscaping. All Rights Reserved.